Could oil and other hydrocarbons be a continuously produced natural geological resource that is - contrary to what we are being told - not running out any time soon? The question - whether hydrocarbons are geological reality instead of the remains of huge quantities of once living matter compressed to become goo - is not as far fetched as it might seem. One of the world's leading advocates for the theory that hydrocarbons are renewable is Dr. Thomas Gold. He contends that oil is not a limited resource, and that oil, natural gas and coal, are not so-called "fossil fuels." "Astronomers have been able to find that hydrocarbons, as oil, gas and coal are called, occur on many other planetary bodies. They are a common substance in the universe. You find it in the kind of gas clouds that made systems like our solar system. You find large quantities of hydrocarbons in them. Is it reasonable to think that our little Earth, one of the planets, contains oil and gas for reasons that are all its own and that these other bodies have it because it was built into them when they were born?" That question makes a lot of sense. After all, they didn't have dinosaurs and ferns on Jupiter to produce oil and gas? The quote is from an article by Joel Bainerman who asks: If hydrocarbons are renewable- then is "Peak Oil" a fraud? The theory that fuels (gas, oil and coal) were made from fossils has gone unchallenged for almost 150 years. This fossil fuels theory (FFT) was formulated in the 1830's on the basis of three observations common to 100 coal mines. During the 1920's, the theory was enhanced by the concept of petroleum being created from marine organisms. Over the years, a significant amount of subtle, yet substantial evidence that argues against the validity of the FFT has accumulated in the literature. These arguments have been condensed into six critical points that simultaneously render strong support to the new theory of fuels formation by natural laws of physics and chemistry. The new energy fuels theory (EFT) explains the formation of fuels (and all known matter) by the logical progression of the transformation of energy particles into atoms, into gaseous molecules, then into liquid and solids via molecular chain-building processes. The intimate relationships of gas, oil and coal, are illustrated by five facts that render additional strong support to the EFT. The immense ramifications of the new concept that appears destined to replace the FFT are briefly discussed. Considering that the "peak oil" alarm was first sounded by a petroleum geologist working for one of the major oil producers, there is a good probability that indeed, as Bainerman suggests, the "peak oil" scare could be a scam designed to justify stratospheric profits of the major petrochemical companies, which we have indeed seen in these last few years. Peak oil, also sometimes called Hubbert's peak, goes back to a prediction, first made in 1949 by M. King Hubbert, a geophysicist and Chief Consultant for the Exploration and Production Research Division of Shell, that oil production would continue to increase but would "peak" in about 1970 and decline thereafter. US oil production has indeed peaked at the predicted time. But some say that this was due to a systematic program of shutting down and sealing many oil and gas producing wells. Not surprisingly however, world production seems reluctant to follow suit. You can shut oil wells in one country, but it is difficult to do so all over the world. Some say the wars in the Middle East were about protecting oil supplies. Wake up, people - those wars did the exact same thing that was done previously on the US mainland. They effectively shut down production. Remember the burning oil fields in Irak after the first oil war there, or the fall in Irak's oil output since the more recent US "shock and awe" campaign? Since there is demand for hydrocarbons and since indeed oil seems to be a renewable and constantly growing resource, as suggested by Gold, Scarborough and others, it is hardly surprising that international oil production has not been hitting its peak just yet. A newfound fungus living in rainforest trees makes biofuel more efficiently than any other known method, researchers say. In fact, it's so good at turning plant matter into fuel that researchers say their discovery calls into question the whole theory of how crude oil was made by nature in the first place. ... "The accepted theory is that crude oil, which is used to make diesel, is formed from the remains of dead plants and animals that have been exposed to heat and pressure for millions of years," Strobel said. "If fungi like this are producing myco-diesel all over the rainforest, they may have contributed to the formation of fossil fuels." The origin of oil is probably not from this source [the fungi] because the agent lives in the wrong place. However; no doubt exists that microbial processes do and have been long known to make oil components. The processes are going to be most useful for synthetic fuel generation. The actual process for making oil is pretty simple and pretty well established. It works like this. (1) Methane from either inorganic or organic process sources percolates upward through geologic formations until it reaches a Shale Layer. (2) In the Shale Layer, there are a series of Trans-Uranium elements including Uranium and also a pretty fair amount of Iron etc. This mixture of metallic elements which is used in Oil drilling to detect deposits, catalytically recombines the methane and links it into various long chain hydrocarbons and a series of Benzene and similar compounds. Occasionally it will link to form Graphite. This process is not the process of ages. It is very fast and the outcome is equilibrium driven to a fairly exact outcome in a geologic instant. (Literally in days or less) Now anybody questioning the process better wise up to the fact that the process known as Catalytic Cracking of Oil was developed from knowing the Shale process. It was discovered to be working underground in the 1930's. Sourcing for the Methane has been much of a question for a long time. The association of Coal deposits and similar was assumed for a long time to be the source of the methane for this process. This is the source of the Biologic theory of Oil Formation that is assumed by many to be fact. Recent Research in Alabama Coal Field Gas deposits has given complete lie to this theory. It was assumed in the late 1970's when Alabama Coal Gas deposits were first drilled that the natural gas in them was from the coal itself interacting with the water in the area. The process was assumed to have sourced the carbon from the coal. Upon drilling the fields the carbon content of the fields was a measured quantity and it was assumed that the coal deposits would have their gas content depleted by 1990. Alabama Coal field deposits saw their productivity rise and rise and there has been no decline in the gas production through 2008. By mid 1990's a serious question developed over the sourcing of Natural Gas. It was assumed that the developments would have run the fields out already. Their production was climbing. The production curves indicated a rise might include 100 times more production than previously estimated. The problem with this estimate was that neither depletion of the coal nor even evidence of any reduction of gas saturation became evident. If the coal was being converted into Natural Gas, it should have begun to have noticeable reductions in coal deposits in the area and none was observed. They had lowered mountains by up to 60 feet by the process and the coal veins were not thinned. The process removes a lot of water. This was the reduction in Mountain elevation. No effect was found on the coal deposits or the saturation of Natural Gas in the Coal. Water was actually depleted in the coal. So where was the natural gas coming from? Research accumulated by the State of Alabama at the University of Alabama in Tuscaloosa found that all evidence pointed to the Shale as a cap preventing the escape of natural gas that was actually sourced far below the site. It was merely a cover. They also found a fair amount of oil developed in the shale boundary. The Coal Field Gas in the USA is not Biologic in Origin. The location of it in Coal fields is an accident of the fact that coal geology includes Shale above it. It is just that a coal field is a good catcher of the gas. The cracking process for natural gas into other compounds is an equilibrium process. It is simply a kinetic energy measure. *combination of heat and pressure as one factor* The higher the pressure the more it tends to Natural Gas. The lower the pressure the more it tends to Oil up to about 10,000 feet down in the ground, then as the pressure lowers it again cracks towards Natural Gas. This is why US Oil, typically a shallow oil, is very heavy fraction crude oil. Middle eastern Oil a bit deeper typically is more light fraction oil. In the South Alabama Gas fields which are very deep (up to 7 miles) the fraction is nearly 99% Natural Gas. These facts point aggressively to a theory that the Russians have of "Magma Oil". There is a very real possibility that Oil as we know it and Natural Gas have no biologic origin at all. One curious factor that is not well known is the radiological data on the age of the oil. It would be assumed, if you believe in the "generally accepted" oil theory of biologic origins, that the radiologic age of the Oil would be about 220 million years. Actually the radiological age of nearly the entire inventory of coal and oil and Natural Gas is about 44,000 years. This is inconsistent with any of the accepted theories for either the age of the earth, evolutionary age or the supposed processes for their formation. One process that was discovered in Alabama in Coal fields is quite interesting. The Carbon in Coal is known to be transient in the Coal. Carbon moving in from lower depths displaces the carbon at an elevation and the upper carbon moves upwards. The structure of the coal remains essentially the same during this process. This migration is not particularly slow. The entire inventory of a coal vein can be exchanged in a matter of a few thousand years. This brings up many questions on Geology and pretty much smashes all of the accepted theories. It is obvious that a great deal of migration of materials happens in the earth's crust and it is fairly rapid. It is obvious that the layers and content of the layers is always dynamically in flux. For example the Iridium layer known as the KT boundary is probably nothing but a chromatological layer. That is a collection filtration that happens as things move geologically. I know this will torque the brain of a lot of people. It says that the earth is a much more dynamic place with much more going on than we thought we knew. 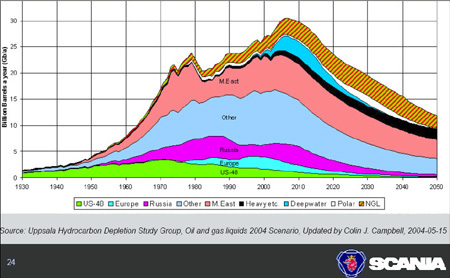 So when you hear about "peak oil" next time, take pause. Question what is being said and form your own opinion. This is not to say that we should not develop energy technology that makes us independent from hydrocarbons. We should. Some nasty pollution results from burning those types of fuel and the air is getting more and more heavy to breathe. I agree that we must change over to solar, wind, tides, waves and even more exotic technologies to make our energy. Look at the New Energy Congress Top 100 new energy technologies to get an idea of what is under development. But ultimately the change to better energy technology isn't dictated by our running out of oil or even by being "over the hump" in oil extraction. It is simply the intelligent choice to make at this time. Let's keep the oil in the ground. There may be far better uses for this resource than simply burning it. Energy: Are Oil And Natural Gas Renewable? "Using our research we can even say where oil could be found in Sweden," says Vladimir Kutcherov, a professor at the Division of Energy Technology at KTH. I wish this information could be spread throughout the world, especially the politicians and oil companies. Of course, these people would have to be educated and have an open mind. excellent site and very informative, surely oil companies and governments must know about this research, it has certainly opened my eyes. I have noticed that work is being done in the disused mine workings in the UK to extract methane. It really does seem like the oil companies, governments are profiteering on false information. Good to see confirmation of possibility of abiotic oil here in the US. The Russians have supposedly drilled holes in Siberia 40,000 feet down (near the mantle) and struck huge quantities of oil where plant and animal life could never have existed. It may be that oil is not a product of decaying plants and insects at all, but just a naturally occurring liquid form of carbon like coal and natural gas. We might eventually understand that the Earth is a huge carbon organism with abiotic oil as blood that we humans such out like hungry mosquitos. With abiotic oil becoming more and more of a confirmed reality, the supposed oil scarcity and the high prices are taking on the looks of a scam, rather than a real emergency of diminishing supply. That is not to say that we shouldn't get off oil because to burn it is polluting the atmosphere in a horrible way, and using oil for energy keeps us dependent on an energy monopoly that has no reason to exist, except our own failure to develop alternatives to it. We should all read Thomas Gold's book "Deep Hot Biosphere." He wrote an earlier one discussing the theory that oil and gas is produced by these microorganisms in the earth's crust. Evidence for these shows up in the hydrothermal vents recently discovered in the ocean floor. I believe we're going to find there are larger and more complex life forms also underneath us and part of the deep hot biosphere. there was huge abiotic hydrocarbon lakes,rivers and ocean once present on the surface of the earth in past geological time. heavy in molecular weight has been reburied after mixing with the organic matter. kerogen,the precursor of global petroleum has been derived only from those organic sedimentary rocks which has been formed with the involvement of this pre generated abiotic hydrocarbons otherwise dry holes and we are getting nothing near there. abiotic sources are the main contributor in global hydrocarbons reservoirs, even in commercial interesting accumulations of hydrocarbons. yes biotic characteristics has been injected in it the burial history of the mixture of organic matter and abiotic hydrocarbon bearing sludge ( once present on the surface of the earth).